Whilst healthy and alive, we seldom think about death. We live as if we have forever. But when our health deteriorates, we suspect death might be around the corner. Truth sinks in and we realise no matter how well we’ve lived our lives, we still are unequipped to face death. Let’s face it: death can be terrifying. With the help of science, we have worked hard to stave off the grim reaper and defy him for as long as we could. But no matter how hard we try, we cannot escape the grim reaper forever. The fact is, we cannot cheat death. Perhaps, that is why we seek answers to questions like ‘what happens when we die’ or ‘what lies on the other side’. At times, we believe in the idea of an immortal soul, which finds its way to a heaven or a hell, or is reborn to be liberated. Unfortunately, since these are unanswered questions, we can only toy with the idea of an afterlife. Afterlife is shrouded in mystery just as much as death is. We like to believe we have a beginning, a middle and an end. But, some of us are convinced that death is not the end. Perhaps, these are individuals with an uncanny ability to sense life in a different realm. Life after death. This quest to understand what lies beyond death led us to Sheelaa M Bajaj. Celebrated for what she does with utmost passion, Bajaj has guided people from around the world to find closure by helping them connect with their loved ones who have passed on to other side. Here’s Soulveda in conversation with the psychic medium herself. You are a psychic medium. Could you tell us about this ability? Well, just the way a normal person communicates with another person, a psychic medium—a person with psychic abilities—can communicate with higher beings called entities. Like me, my older son who is 15 now can sense entities. He can even communicate with them. He’s probably had this gift since birth. So, I think psychic ability is something to be gifted with. I’m not sure if it can be acquired. But, if one has this inborn gift, one can fine-tune this ability over the years. For instance, over time, I have discovered ways to turn off my senses so that I am not bombarded by them all the time. I have also developed techniques to deal with them, clear them and communicate with them. Could you describe what entities are? Entities are disembodied beings—beings without bodies. When a person dies, they leave behind their bodies. They ideally ought to move on to a different realm. But sometimes they get lost and find themselves stuck on the earth plane. They are lost wandering souls that are looking for directions. Other times, they stay back because they have some unfinished business. Entities however are not scary or spooky as movies make them out to be. They do not intend to mess with us or hurt us. They are just lost people who are seeking help. So, they attach themselves to a living person. Just then, the lights around her picture flickered. And I sensed that his daughter was around him and wanted to communicate to him. When did you first realise that you had the ability to connect with entities? I’ve had this gift for as long as I can remember. There was no specific moment when I realised that I have psychic abilities. You see, I used to be a healer and a tarot card reader. During such readings, I used to help people communicate with their lost loved ones. So, over the last 20 years I discovered my ability to communicate with entities gradually. Do all dead people become entities? Or do some move on to other realms and rest in peace? All dead people do not become entities. Many go on to different dimensions hassle-free. It’s only some of them who get stuck. So yes, a lot of dead people move on to other realms and rest in peace. But a few stay back because they have unfinished work. And once they complete their work, they move on peacefully. But most entities are simply lost; they are just seeking directions. Could you share an experience with us? Once while boarding a cab, I noticed a girl’s photograph decorated with lights and flowers. Something made me ask the cab driver who she was. He replied that it was his daughter. Just then, the lights around her picture flickered. And I sensed that his daughter was around him and wanted to communicate to him. So, I started conversing with the driver. I divulged a few facts about his daughter, like her favorite dish and dessert. He seemed surprised. He then revealed that whenever his family cooked her favorite dishes at home, somehow, a water bottle or a utensil always tips off the table and falls on the floor. I then told him that by doing so, his daughter was trying to grab his attention and say that she is around him. Finally, I asked the driver if he was in contact with someone his daughter never used to like. He confessed there was a woman. Apparently, the daughter wanted to protect her father from her. She was mixing something in his food whenever he visited her. Not surprisingly, he too admitted to having recurrent stomach issues. I relayed all that she’d wanted to communicate to him and helped her complete her work in this realm. Often when psychic abilities are put to test, results turn up negative. What do you have to say about that? I don’t know if tests would work for any such experiences. We cannot put a test to God or a temple or a ritual. When people pray, and their prayers are answered, scientific tests cannot begin to explain how. In fact, science cannot explain most spiritual experiences. In my line of work, I’ve seen many people who have had experiences with entities. And many have approached me to be cleared of them. So, I feel testimonials of such people are proof enough that entities exist. They are proof that they can be communicated with, helped and cleared. 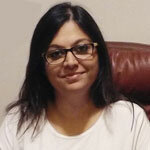 Sheelaa M Bajaj is a Bengaluru-based celebrity numerologist, tarot reader and Feng Shui master among other things. She has trained under various masters from around the world and teaches master-level courses in esoteric sciences. In addition to being a holistic healer and spiritual teacher, she is also the author of The Love Mirage.